Transform yourself into a walking warning sign with this shirt, all with the simple intent of warning others. The Zombie Warning T-Shirt could actually be taken in one of two ways, although both are important when it comes to zombie safety. This t-shirt is made from quality fabric to ensure a comfortable fit. 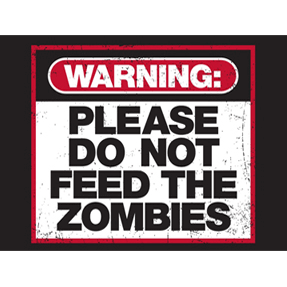 It depicts a classic warning sign, albeit one that features a decidedly zombified twist. The decal on the shirt features a red border that encloses a black and white sign. The black, upper portion of the decal features a red oval that reads Warning in bold white letters. The rest of the sign is white and features black lettering that reads simply Please do not feed the zombies. 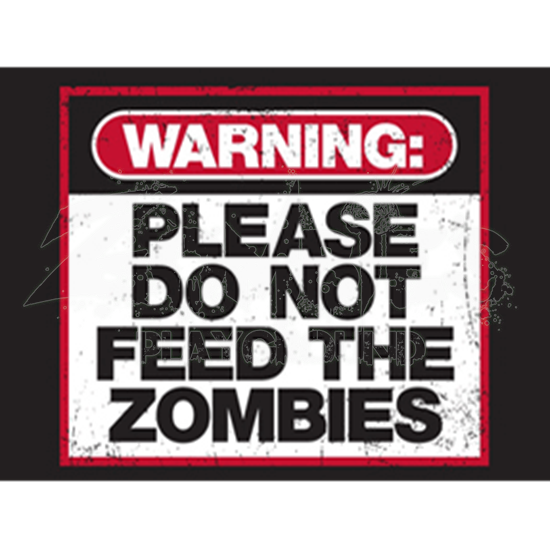 Either this shirt is a warning to all inquisitive and curious folk to not risk harm by trying to feed the zombies, or this Zombie Warning T-Shirt is a deeper message about zombie preparedness, so that others do not become zombie food by being totally unprepared for a zombie outbreak. Either way, it is a good warning.